After adding Vinod Khosla to its board a few weeks ago, mobile payments startup Square is racking up another big name to its board of directors—Larry Summers. 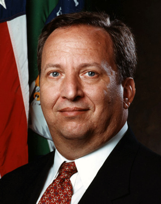 Summers served as Secretary of the Treasury of the United States from 1999 to 2001, and was most recently the Chief Economic Advisor to President Obama. Square says that it has created a new seat on its board for Summers. Square CEO and co-founder Jack Dorsey said this of Summers joining the board: We are proud to have Larry join our board and we welcome his insight and decades of leadership to our growing company…Square is at a key point in our trajectory and we know Larry will contribute tremendous wisdom and expertise toward our continued success. In addition to his roles in serving the U.S. government, Summers was also the 27th President of Harvard University where he remained for 5 years. He joined the National Economic Council in 2009 where he served as Chief Economic Advisor to the President. Currently Summers is a professor at Harvard University. Whereas Khosla adds Silicon Valley technology and investment clout to Square’s board, Summers adds financial and government depth to Square’s board. It’s impressive for a payments company to have a former U.S. economic chief and Treasury head advising the company. The mobile payments company also received a vote of confidence from the finance industry with a strategic investment from Visa a few months ago. And an exec from bank J.P. Morgan Chase is currently an advisor to the company. Summers has actually invested and advised technology companies previously, including The Big Think. Summers is also on the board at Revolution Money. It’s no secret that Square is growing like crazy. And the company is also reportedly raising $50 million-plus in new funding at a whopping $2 billion valuation. Which brings up the question—did Summers get a board seat because he invested in Square?